The European directives on public procurement do not contain any specific provisions ensuring their effective application. These provisions can be found in the Public Sector Remedies Directive 89/665/EEC and the Utilities Remedies Directive 92/13/EEC, as these directives have recently been amended by Directive 2007/66/EC. These measures provide means of redress for tenderers who have been prejudiced by a breach of the EU rules on public procurement. 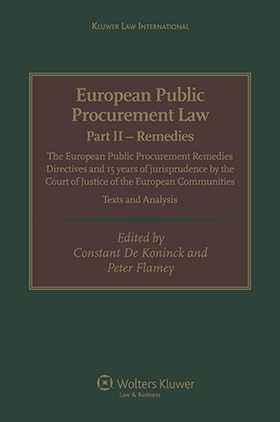 By thus combining the theory and ‘reality’ of European procurement law the book not only saves readers time and effort, but also provides profound and practical insight into the Remedies Directives and the important rights and obligations which they create. The pursuit of remedies for breaches of the EU procurement rules is a topic of high interest to public authorities and their suppliers, contractors and service providers across Europe. This book will be of great value to practitioners and to officials charged with ensuring that decisions taken by the public contracting authorities and entities may be reviewed effectively and rapidly, thus building confidence among businesses and the public that public procurement procedures are fair. List of Abbreviations. Introduction. Modus operandi. I. The Amending Directive 2007/66/EC. II. The EU Remedies Directives 89/665/EEC and 92/13/EEC. III. Analysis of the Case Law Relating to Provisions of the EU Remedies Directives 89/665/EEC and 92/13/EEC. IV. Judgements Rendered by the Court of Justice in the Period 1993–2008 and Regarding Public Procurement Review Procedures and Remedies – Relevant Excerpts. Appendices: 1. Preamble of Amending Directive 2007/66/EC. 2 . European Commission – Impact Assessment Report – Remedies in the Field of Public Procurement. 3. Relevant Articles of the Treaty Establishing the European Community (EC Treaty). 4. Table of Cases before the European Court of Justice Arranged According to the Date of Judgement. 5. Table of Cases before the European Court of Justice Arranged According to their Case Number. 6. Alphabetical Table of Cases and Parties. 7. Correlation Tables. 8. Juxtaposition of the Texts of the Public Procurement Remedies Directives before and after Amending Directive 2007/66/EC. Subject Index. About the Authors.